What do you get back from dollars your business spends? If the answer isn't rewards you should consider the Ink Business Preferred℠ Credit Card. Earn a massive 80,000-bonus points after spending $5,000 on purchases in the first 3 months from account opening. That is worth at least $1,000 in free travel when redeemed through Chase Ultimate® Rewards. Then earn 3 points per $1 on the first $150,000 spent in select categories each year. Earn 1 point per $1 on everything else, with no limit to the amount you can earn. This card has no foreign transaction fees. Chase points case be used to purchase travel through the Ultimate Rewards® portal – and points don’t expire. Cardholders can also transfer points to leading frequent travel programs 1:1, including United and Southwest for travel around the world. This card has a $95 annual fee, with no introductory rate. The APR rate for purchases and balance transfers ranges from 18.24% - 23.24% Variable based on your credit history. Pay 27.24% Variable on cash advances. A penalty APR does not apply for this card. Chase Ultimate Rewards® is a top travel rewards program today. The points can be used for travel purchases as well as be transferred to airline and hotel partners, which can give you even more value per point. The bonus points you can earn in the first 3 months alone is worth $1,000 toward travel when you redeem through Chase Ultimate Rewards®. This card offers flexible, lucrative points you can use to travel across in the world. It is our favorite card for business travel rewards. Some business owners struggle to reach top-tier cards due to a few credit mistakes in the past. That shouldn’t keep you from earning valuable cash back from your purchases. Capital One® Spark® Classic for Business offers 1% cash back on all purchases. There is no limit to how much you earn, and no minimum to redeem. Use this card to strengthen your credit and your business credit with no annual fee. 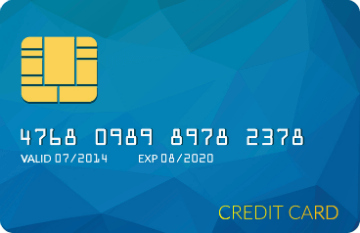 This card is designed for people with less than stellar credit. Pay 25.24% Variable APR on purchases if you don’t pay your bill in full each month. Some cards do offer more compelling rewards but require excellent credit. If you are looking for a simple business credit card with no annual fee, this is a great choice. Earn 1% cash back across the board on all purchases. Use rewards however you choose. Add additional cards for employees at no extra cost. This card charges no foreign transaction fees. It is a great addition to any business owner’s wallet. 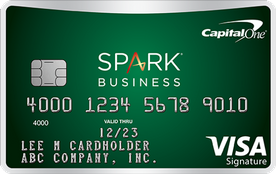 If you want cash back from your business purchases, Capital One® Spark® Cash for Business is a great choice. Card holders earn 2% cash back for all purchase, which helps bring money back into your business. In addition, earn $500 bonus cash back after spending $4,500 in the first 3 months. If you want simple, lucrative cash back for your purchases, this is the card for you. 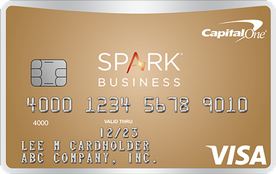 Capital One® Spark® Cash for Business has a $95 annual fee, with an introductory rate of $0 first year. The card charges 19.24% Variable APR on purchases and balance transfers. Pay 25.24% Variable on cash advances. Missed payments lead to a penalty APR of 31.65% variable. This card is the best cash back credit card for businesses today. Earning 2% cash back can help your business earn profits from every purchase. The $500 bonus makes this a lucrative card. Add employees for no extra fee. Business owners looking to earn from every purchase should look no further. Methodology SmartAsset has developed a quantitative and independent system for evaluating the relative value of a credit card offer versus other offers in the marketplace. Our system evaluates cards based exclusively on their features, such as their rewards earning rate (if applicable), fees, perks, and rewards program redemption options. The annual rewards values on this page are calculated using annual spending assumptions in various categories such as, but not limited to, gas, restaurants, airfare, and US supermarkets. These spending assumptions are built on research that SmartAsset has conducted on existing small business credit cardholders. Our promise with our credit card recommendations is that we will always strive to have the most comprehensive, accurate, and objective method of evaluating credit card offers. Any recommendations are solely determined by the result of this research and model, and is never influenced by any fees, commissions, or other forms of compensation that SmartAsset may receive from credit card issuers for leads generated on our website.